Joker and Freddie at the gate where Freddie gets his bottle. A bit of a stand-off. Christmas in mid-summer always catches me unprepared—not just for the weather, but because it seems weird to be preparing for Christmas as the days get much longer as well as hotter. 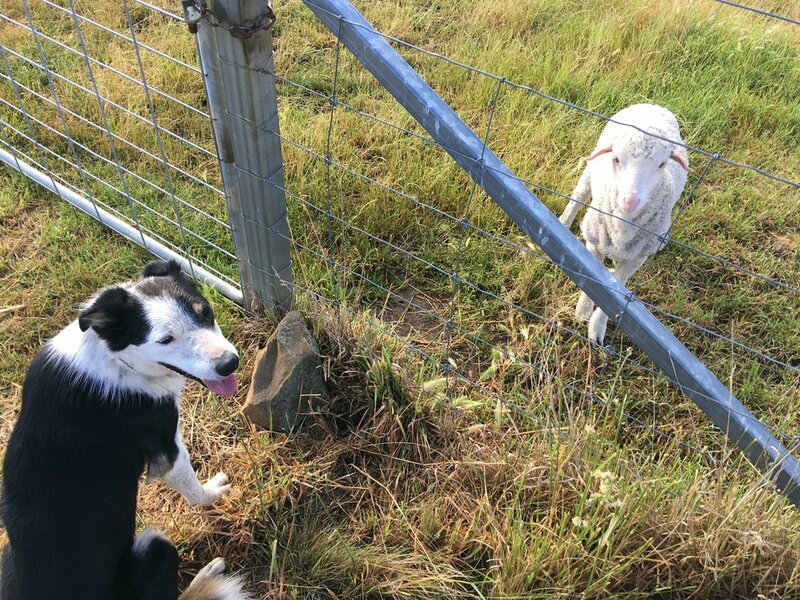 There is lots to do on the farm, preparing for fire season and fly season and managing the ewes and lambs through the occasionally tricky period of maximum milk production, until the lambs are well and truly on their way to feeding themselves. Freddie with a salsify blossom sticking out the side of his mouth. He grazes from blossom to blossom: dandelions, milk thistles, salsify, clover…and roses. We crutched and jetted (for flystrike prevention) last Friday, and until that was done and the sheep safely tucked away in their new paddocks for summer I just couldn’t seem to get myself into much of a Christmas spirit. But the last few days I’ve had time to reflect on the year past and the year ahead, and to think about what message I'd like to send all of you. The first half of the she-oak grove is planted! It’s so easy to fall into the darkness that seems to loom over the globe at the moment. To counteract that effect, I’ve been focusing on small, real things that bring me joy and remind me of what really matters. Today, Christmas Day in Australia, I planted she-oak seedlings that have been waiting patiently in their pots for years. Today was finally the day! And I spent a magical half-hour watching my bottle lamb Frederic as he sought out delicious forages. It really felt like all is well. I hope your holidays are filled with loving moments, joy and serenity.